Irish Folk Furniture is a stop-motion documentary, 8½ minutes long, that won an award for animation at the Sundance Film Festival last month. Director Tony Donoghue thought it might be too specialist to appeal widely, but it has charmed its way around the festival circuit. I recommend it warmly. 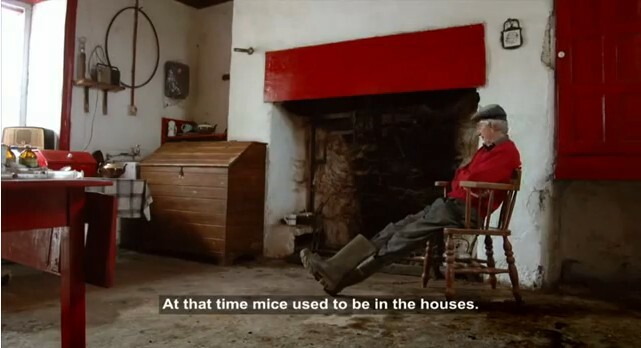 The film celebrates the tradition and use of farmhouse furniture in Ireland, with 16 items restored to a functional state. This is furniture not usually seen as beautiful – or starring in a film – but whose appeal lies in its very ordinariness and utility, and in the history it amasses over generations of use. It’s a quiet gem in both form and content: as if Jan Švankmajer had rambled down a boreen in Tipperary. Dressers and flour bins wheel around the countryside while their owners chat away. The film is gently funny, beautifully shot, and features some lovely rural Irish accents and syntax, e.g. done as preterite in “we done a good bit on ’em”. Edit: I’ve removed the video after seeing a comment on YouTube from Tony Donoghue saying his film was only meant to be online for the two weeks of Sundance, and that its continued online presence may undermine its film festival run. If it reappears legitimately, I’ll reinstate it here.